Turtles have survived the last 200 million years. They are reptiles that live their entire lives in the sea except the female who briefly leaves the sea, struggling ashore to lay her eggs. They're only natural predator is the shark. But all species have become endangered by the actions of man. 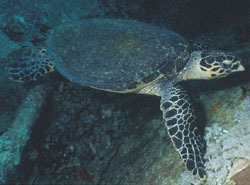 A Male HawksBill Turtle, Photo by Colin Mc Farlane Aquaturtle offers a Turtle specialty course, which has been excepted by PADI as a distinctive Specialty. This can be credited towards the Master Scuba Diver rating. Here you will learn all about Turtles, how to recognise male from female and know the 8 species, and above all else to give the diver an understanding and respect for the Turtle. Hopefully this understanding will help in some small way to protecting these Fascinating creatures of the Sea. I found many divers seemed to know about Sharks but there was a lack of Knowledge/interest about Turtles! 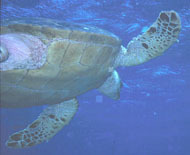 My first encounter of a Turtle was 4 divers pressing a Turtle against the coral at Ras Mohammed many years ago. The poor Turtle was in alot of stress but the divers seemed unaware of this fact. I started asking questions like "What kind of Turtles is this?" Or " How do you tell if it's a male or female?" Not many could give an answer. So I started investigating the Turtle. There are lots you can do to help the Sea Turtle. You can start by picking up plastic bags, fishing line or any other rubbish found in or around the sea that's a good use for your BCD pocket. (please do not put sharp objects like cans, broken bottles or fishing hooks in your BCD). You should never try to touch or hold onto a Turtle as they can panic, and their instincts are to dive deeper to get away from you, which could lead to drowning because they will stay down longer when they should be resurfacing to breathe.